Advertisers should stop trying to be funny if they want their videos to go viral and brands should launch video campaigns on a Wednesday to maximize sharing, according to new research. The Science of Sharing white paper by video technology company Unruly, found the two most popular ads from this year's Super Bowl – Budweiser's "brotherhood" and Ram Trucks' "farmer" – attracted the most shares on Facebook, Twitter and the blogosphere because they did not try to make people laugh. The research attributed the ads' success to the intense emotional responses, including warmth, happiness, awe and pride, they invoked in viewers. The most-shared work gave viewers strong reasons, such as "reaction seeking" and the "desire for others to feel the same way", to share their experiences of the ad. The least-shared ads triggered low levels of "hilarity and surprise", caused confusion and failed to resonate with audiences. Brands need to be extremely funny to impress consumers, who have been over exposed to ads that try to be funny but usually fail, according to the report. Unruly's research also reveals that Wednesday is the best day to release a new campaign across the social web. Half (48.3 per cent) of the weekly video shares occur between Wednesday and Friday, on average. A quarter of a video's total shares occur in the first three days of launch. This figure peaks on a Friday, before falling to its lowest point at the weekend. Sarah Wood, co-founder and chief operating officer of Unruly, said: "For brands looking to optimise their chances of viral success, the video really needs to reach a critical mass of viewers within the first 24 hours of its launch. "Creating shareable content is half the challenge. It's equally important to get the ad seen by the right audiences, where consumers are discovering and sharing video content in their native environments. "With social video, brands can win fast and lose fast, so it's important to optimize the launch date for 'shareability' and get content trending quickly across the right distribution channels." The research looked at 12 ads from the automotive, consumer packaged goods (CPG)/fast moving consumer goods (FMCG), entertainment and technology sectors, broadcast during Super Bowl XLVII on 3 February 2013. Year-on-year sharing of Super Bowl ads grew by 118 per cent from 2012 to 2013. Super Bowl teasers and ads generated 7,739,917 shares in 2013, up from 3,546,560 in 2012. 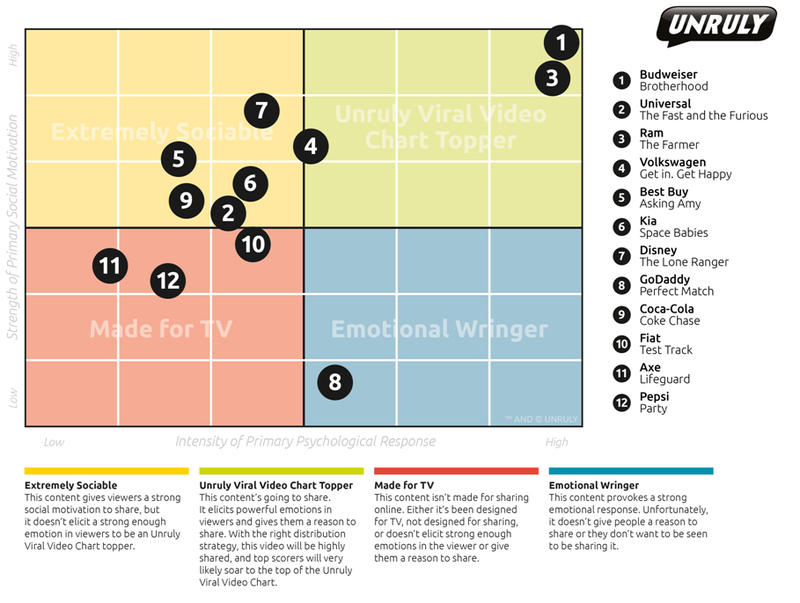 The graph illustrates the intensity of two of the key factors in an ad’s "shareability" – psychological responses and social motivations. 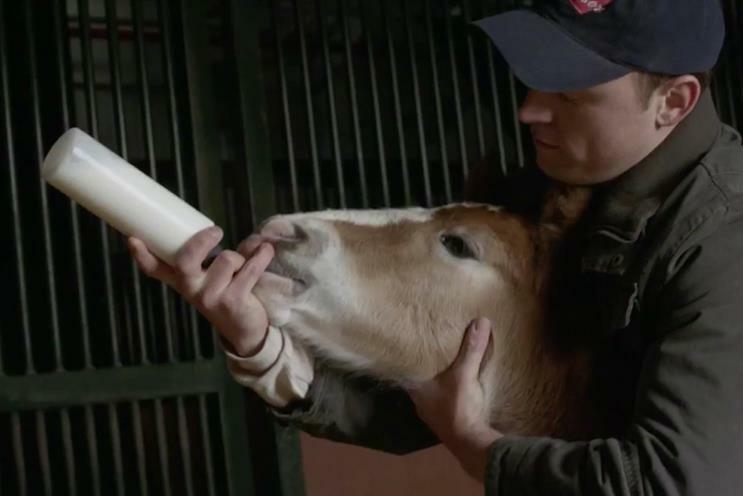 The two strongest – Budweiser’s "brotherhood" and Ram Trucks’ "farmer" – both elicited intense psychological responses and strong motivations to share.